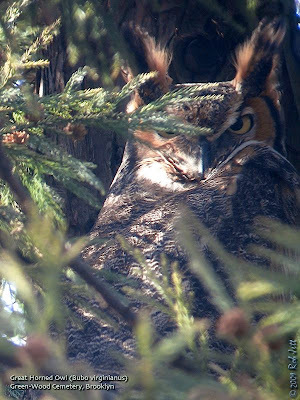 Below is a list and links to some of next weekend's nature trips and events around NYC. Registrar: Karen Asakawa (avocet501 [at] gmail.com). Trips normally are limited to 12-18 participants. To join a field trip with registration, contact the registrar (as early in the registration period as possible). Registration periods normally last two weeks. When a field trip is over-subscribed, members will have preference over nonmembers and drivers (whether or not members) willing to take others will have preference over everyone. Space permitting, nonmembers are welcome. Winter brings many unique and rare birds to NYC that can’t be found here at any other time! Some of the most exciting are the “snow birds,” birds of the Arctic tundra which can occasionally be found in tundra-like habitats further south, such as Snow Buntings and Snowy Owls. We will travel to Floyd Bennett Field in search of these and other winter species (Horned Lark, Tree Sparrow, and Rough-legged Hawk are possible). We will then head to Fort Tilden and Breezy Point to look for wintering ducks, grebes, loons, and other seabirds. Bring lunch, water, and binoculars, and dress for the cold! Limited to 13. This afternoon Doug called me from the Brooklyn Botanic Garden with another White-winged Crossbill sighting. Despite the 17 degree forecast, I pedaled over to the cemetery this morning. What was I thinking? I love cycling, birds and nature (and I'm usually pretty resistant to the cold), but I only lasted about 90 minutes this morning. The inviting sunshine and crystal-clear arctic air had me rushing out the door, but my finger tips began to ache shortly after I stopped riding. I wanted to go home and make some hot chocolate. I quietly tip-toed around when I was near the owl nest and managed to take a few photos of the sleeping raptor. Whenever I'm near her, I try to be as unobtrusive as possible, so I only stayed for a short time. She looked perfectly comfortable and toasty wrapped in her dense layer of feathers. When the sun peeked out around the edge of the tree, she tipped her face towards the warmth. While I was in the cemetery, I also took a look at the Red-tailed Hawk nest, to see if they've begun refurbishing for the new season. It looked about the same since my last visit, but they should start work soon. 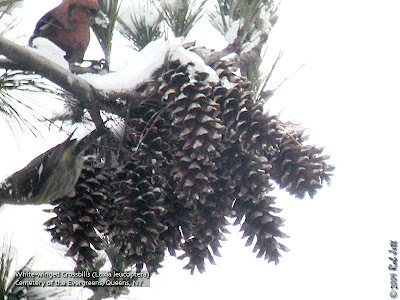 Found a great link to a Wisconsin birder's posting on White-winged Crossbills. "Mike's Birding and Digiscoping Blog" has a really good write-up, photos and this video about crossbills. I just received an email from my friend, Janet, about a late day visitor to her fire escape. 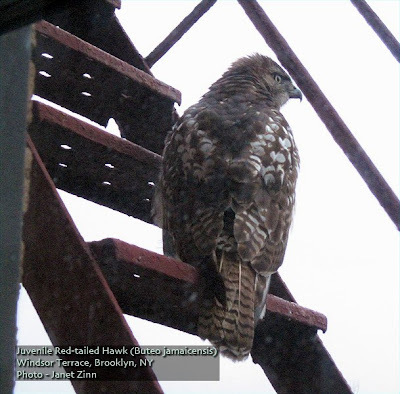 I thought you'd like this--there's a Red-tailed Hawk on my fire escape and he's (she?) been there since about 6 pm! Its after midnight now so it looks like he's spending the night. He's asleep.... Very cool!! I tried to get some shots while it was still light with my point and shoot! Biologist and former urban park ranger Bob DeCandido leads regular birding trips in Central Park. The Queens County Bird Club has a trip to Montauk Point this Sunday. Great winter birds always greet us in Montauk. Dress warm, wear waterproof boots, bring hot drinks and lunch. Leaders Linda & Rick will meet participants at the Princess Diner, Southampton at 8 a.m. Carpooling is optional. TIME & PLACE: 6:30 am Lower Alley Parking Lot (Winchester Boulevard) for carpooling or 8:00 a.m. Princess Diner, Southampton. It is recommended arrangements be made beforehand by e-mail or telephone. 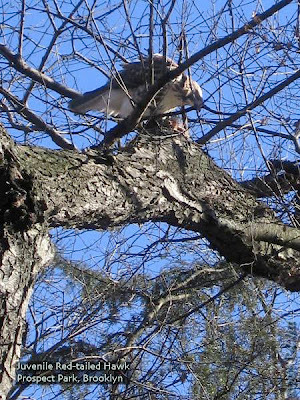 In 2003, Prospect Park's newest resident Red-tailed Hawks, "Big Mama" and her mate, "Split-tail", moved to a new nest. They went from the busy location above the 3rd Street crosswalk to the relatively secluded North Zoo Woods. Unfortunately, their offspring that year had serious problems. They hatched three young, but as their fledge date approached, I realized something was wrong with at least two of the eyasses. They had developed a condition called "frounce". If left untreated, they birds would die. The next morning morning I received a call that two of the three young hawks were found wandering on the sidewalk at the adjacent Flatbush Avenue. They were taken to a rehabilitator, but one bird eventually died. The second recovered, but was unreleasable as he was unable to hunt on his own. The Prospect Park Zoo created a small aviary where this hawk has lived since 2003. The third eyass was healthy, became independent and moved out of the park. On Sunday I went over to The Cemetery of the Evergreens with my friends Peter and Mary. We were scouting the area for a birding trip I'll be leading in the early Spring. It will include Highland Park, the Ridgewood Reservoir and the cemetery. I've been meaning to explore "The Evergreens" for the last year. We certainly picked a fine day that included a couple of surprises. It had snowed overnight. A light, fluffy, white mantle covered every twig on every branch on every tree. The winds were calm and the snow deadened all sounds. It was a surreal, magical landscape in the cemetery. The sun broke through the clouds briefly while we trudged up and down the snow covered hillsides. We spotted a pair of Red-tailed Hawks flying low through the trees. Nearby, at Mt. Magnolia, I noticed a nest close to the top of a tree. It was large enough to be a red-tail nest. One of the two birds flew off to our right. Mary and I got him in our bins and said, almost in unison, "Where's his belly-band?" It was the first time that I've ever seen a Red-tailed Hawk without the dark brown streaks across the belly. Had we not seen his signature red tail, I would have been completely confused. The morning had been pretty uneventful up to that point. There wasn't much bird activity and we spent more time looking at animal tracks in the snow. We returned to Peter's car to drive around the cemetery one last time before leaving. Near the northern boundary of the cemetery we spotted a few stands of conifers. We had been checking for signs of owls, so we decided to park the car and give it a look. Mary had walked a short distance ahead of Peter and I. After a moment she said something like, "Hey guys, I have some interesting birds at the tops of these pines." The first thing I noticed was that they were prying open pine cones to eat the seeds. CROSSBILLS! It was a flock of White-winged Crossbills. Peter and I began running across the field. The White-winged Crossbill is known as an irruptive species. They are normally found in the far north, but occasionally conditions will force these birds into New York City in search of food. This is one of those years. I've seen them several times in the Adirondacks and once, in 1991, at Fort Tilden, here in Brooklyn. There were 26 individuals in the flock at the cemetery hyperactively moving from cone to cone. I attempted to take some photos of the flock. In the process I gained new found respect for wildlife photographers. Twenty-six hyperactive birds and, seemingly, all the time in the world, yet I could only manage a few poorly exposed, badly composed, noisy, blurry images. This one was the best of the lot. We alternately watched the birds, sent out text messages and called friends. After about 15 minutes the flock took off, heading south. They were never relocated in the cemetery. When I spoke to Marge about the crossbills, I suggested that Green-Wood Cemetery might be a good place to look for them. 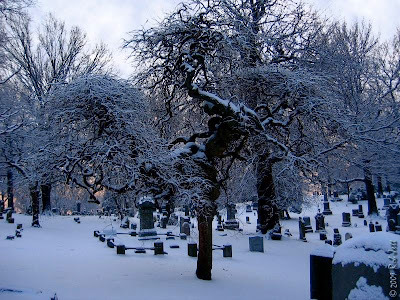 In fact, I think Green-Wood has many more conifers than the Cemetery of the Evergreens (go figure). This morning she called and asked if I wanted to join her at Green-Wood. I had work to do, but decided I should take about an hour break at noon, anyway, so ... you get the picture. At the cemetery we ran into Mary's friend, Kevin, who joined us for the winter finch hunt. We were striking out and I was watching the clock when I saw Marge motioning to us. She had stumbled on our favorite owl; always a nice consolation prize. After a couple of minutes we walked back to the road and headed towards Marge's car. I heard Kevin, unexpectedly say, "There's another one." 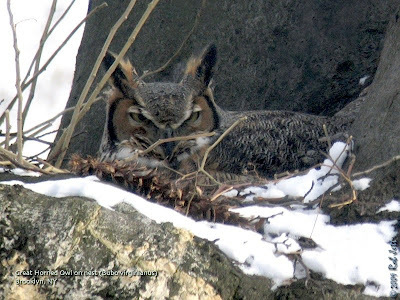 It wasn't just another owl, it was an owl sitting on a nest! We were stunned, to say the least. Ever since a dead owl was found in 2007, we had assumed that there was only one left in the cemetery. Last weekend I did some exploring on bike along the (in)famous Gowanus Canal. 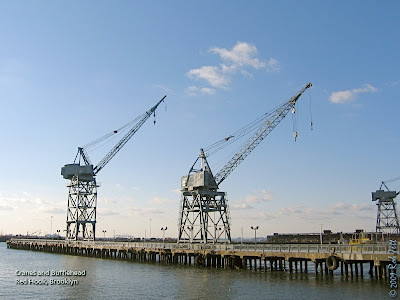 I ended up in Red Hook and checked out a tiny park-like area behind the Ikea, then down the Columbia Street Pier. Towards the end of the day I headed along the eastern side of the canal and down to the old Bush Terminal piers below Sunset Park. The Gowanus Canal has a long and sordid past, but was originally a marsh and wetland. 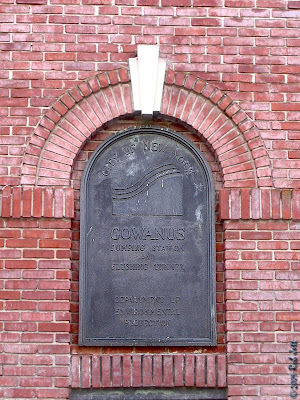 In 1776, during the Battle for Brooklyn, several of Washington's troops died trying to cross the Gowanus to escape the advancing British troops. Up until 1999, most people believed that merely dipping a toe into the canal's toxic soup was enough to kill you. Fortunately, an old flushing tunnel designed to circulate fresh water via Buttermilk Channel was repaired and the toxic sludge that had accumulated on the bottom was removed. My usual perspective of the canal is from the "F" train as it crosses high above the water on the Independent Line Viaduct. Low, flat-roofed warehouses and factories lining the Gowanus are a favorite roost for winter gulls and I've been curious what other wildlife might exist around the Red Hook waterway. 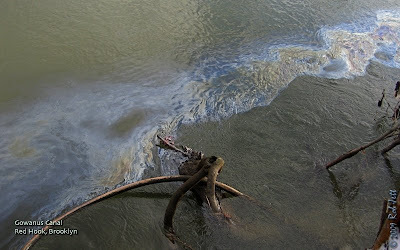 Much of the scenery that surrounds the water is interesting, at best, and an eyesore to many. (For an excellent walking tour, check out Forgotten NY.) 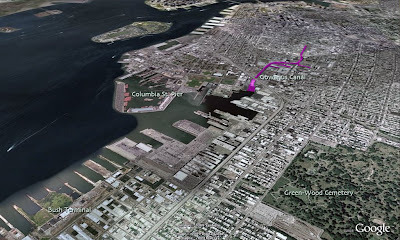 Starting on Butler Street, at the "Gowanus Pumping Station and Flushing Tunnel", then along the east side of the canal to Gowanus Bay I had limited access to the waterway. There were the bridges (Union Street Bridge, Carroll Street Bridge, 3rd Street Bridge and 9th Street Bridge) and two dead-end, trash strew streets (Degraw and Sackett Streets). Finally, the parking lots at Lowes and Pathmark offered wide views. From the edge of the canal one can scan the Independent Line Viaduct, the Gowanus Expressway Viaduct, a metal recycling plant, oil storage facility and cement mixing company. The next access to the water along the eastern route wasn't until I'd pedaled all the way to 28th Street and 2nd Avenue; over a mile away. Most of the canal route is blocked by large, warehouse-type buildings and "No Trespassing" signs. It was low-tide when I arrived at the northern end of the canal. 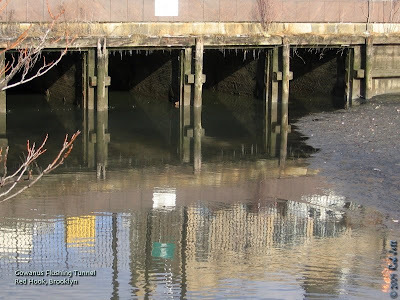 Water was flowing out of the flushing tunnel and Ring-billed Gulls were foraging in any exposed mud banks. Perhaps in the Spring I'll find migrating shorebirds in those mud banks. A small flock of black ducks and Mallards found food in the water near Degraw Street and dabbled in the flowing stream. From the western side of the canal I rode down Bond Street to where the waterway makes a ninety-degree turn in the direction of Smith Street. The one open lot that I can see from the subway viaduct is surrounded by a high chainlink fence. A warehouse between Nelson and Huntington Street is a favorite winter roost for gulls and many were flying to and from the Gowanus Bay. There was no access to the water for the next mile and I continued to the new Ikea store, next to Red Hook Park. The Ikea property has a small park at the edge of the water. It is mainly grass habitat with borders of ornamental fountain grass and small, fruiting shrubs. A long pier extends out into the bay, but is closed to the public. Buffleheads were the most numerous waterfowl and flocks of gulls roosted on barges anchored at the Erie Basin facility across the way. I came back to this area the following weekend and found a Lesser Black-backed Gull roosting among the more common gulls. The Columbia Street pier is a public space that extends nearly half a mile into Gowanus Bay. It is the best place to view the water, as well as, the terminal moraine that slopes up from the coast to Park Slope, Green-Wood Cemetery and Sunset Park. It is the view that advancing British troops would have had as they pursued George Washington and his troops during the Battle for Brooklyn. 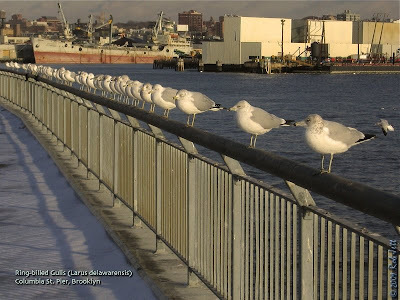 The pier's railing was lined with Ring-billed Gulls. On the water there were scattered cormorant, Gadwall, American Wigeon, American Black Duck, Mallard, scaup, Bufflehead and Red-breasted Merganser; the most birds I had seen all day. I could barely make out other birds within the protection of the piers on the opposite shore or perched on rotting, wood pilings. I headed back to the other side and towards Bush Terminal. I rode passed the NYC Metropolitan Detention Ceter (aka "Jail"), where there is a very limited view of the water near a large parking lot. I saw Canvasback at this location several years ago. Maybe they were visiting a family member. The roadway in this area of old Brooklyn is treacherous for cycling. There are sections of remnant cobblestone and patchwork asphalt bisected by old freight lines. I've been waiting for all the snow and ice to melt before attempting this section again. I need to be very clear about one small detail. The Bush Terminal property is accessible by permission ONLY. I, very naively, rode passed a guardhouse, waved at the security guard and kept going. He probably thought I worked there and didn't stop me. This is not something I recommend if you plan to explore the area. I have since returned, but with permission from the NYC Economic Development Corporation, the agency that controls it. Who, Who Do You See? This year I've decided to include upcoming nature events on my blog. If your group has nature walks, talks or other events open to the public that you'd like posted on The City Birder, just post a note in the comments. Marge relocated the cemetery Great Horned Owl. I went back with her the next day and was able to take some nice photos. Most owls are very good at remaining hidden, but this one has managed to elude us for the better part of three years. 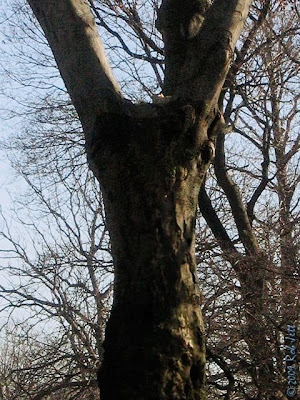 I never divulge the exact locations of the owls that I observe around the city and rarely even mention the park. 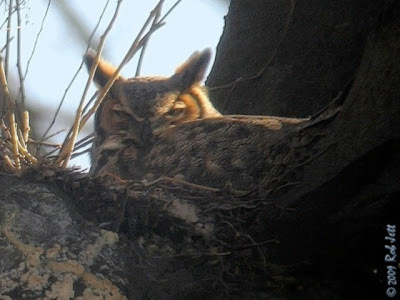 In the case of the cemetery owl, I feel confident that even though I've revealed that it is in Green-Wood Cemetery, you'll still never find him. We've also made it a point to tell the 24 hour security patrols and landscape management department about the owl and the importance of protecting him. On Thursday, while I was taking some pictures, Marge drove to the main office and lead Bobby, the head of security, back to see Bubo virginianus. On the surface, Bobby is a stereotypical tough, retired NYC Sergeant of Detectives and I imagine that he has seen just about everything in this city that never sleeps. As he peered into my scope I watched his cool, restrained expression change dramatically. His eyes widened like saucers, as if he was mimicking the owl. He said, "How did you manage to see him?!" Even he was affected by the sight of this magnificent bird. I can't believe another year is behind me. The good news is that it's the start of 12 more months of urban nature discoveries. This year I've decided to combine my New York City birding and nature exploring with as much cycling as possible (excluding blizzards, hurricanes and tornadoes). New Year's day I just did a little walking around Prospect Park in the blustery weather, but on the 2nd I hopped on my bicycle early in the morning. I rode south, to Gravesend Bay, then over to Dreier-Offerman Park. It was pretty cold and I got hit with some snow and freezing rain on my way back. On New Years Day most of the bird activity seemed to be centered around Peter's feeders on Breeze Hill. Perhaps the cold weather and an abundance of raptors were keeping the little birdies more cautious than usual. There were the expected collection of woodpeckers, nuthatches, chickadees, titmice and goldfinches on the feeders. On the ground beneath were Mourning Doves, White-thoated Sparrows, juncos and a single Fox Sparrow. At the north end of the Nethermead Meadow a juvenile red-tail feasted on a freshly caught squirrel. About 50 yards to his west sat a female Merlin. She was at a favorite location above the bridle path. Horse hooves turn over the soil and sparrows dart in and out of the woods to forage along the path edges. Frequently, before they can react, the Merlin will cut through the flock like a bullet and there will be one less bird in the flock. There were two other juvenile Red-tailed Hawks on the east side of Lookout Hill. One was the pale-headed individual that I've been seeing for a couple of months. A much larger, red-brown headed juvenile chased him away. 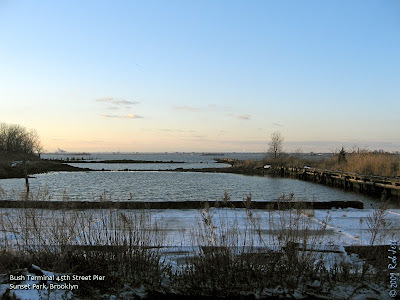 On Friday, January 2, I packed my bins and pedaled towards the water. I've discovered a new route along 6th Avenue. I turn off at 68th Street, passed Owl's Head Park to the 70th Street pier. 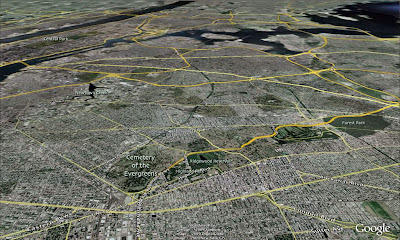 That's where the bike path begins and follows the coast towards the Verrazano Bridge and Bensonhurst Park. There's usually a lot of gulls on the pier, but the wind was apparently too strong for them as there were only a few scatter Ring-billed Gulls. It was high-tide and I noticed a lot of wooden debris being pushed into the rocky coastline. I scanned the water as I pedaled slowly along the promenade. One round piece of wood caught my eye. I appeared to have eyes, whiskers, ears and a snout ... the Harbor Seal looked around for a moment before tipping his head back, then slipping silently under the choppy water. At just under 5 miles to the tip of Manhattan, he was the most "urban" seal I've ever witnessed. The boulders that line the water's edge were glazed with a coating of ice. In some spots green seaweed tinted the white veneer. 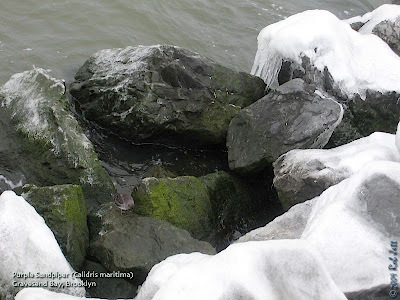 Purple Sandpipers have returned to Brooklyn for the winter season. I counted 14 of these hardy shorebirds feeding on the rocky edges of the borough. South of the bridge the wind was pushing waves of seawater up over the retaining wall and onto the pedestrian path. Gulls, cowbirds, starlings and Brant intermingled on the grass median between the highway and bikeway. Scaup and Common Goldeneye flocks calmly rode the rough surf like the chop was nothing more than gentle swells. Most of the bird activity at Dreier-Offerman Park was confined to the protected cove on the peninsula's south side. The strong winds kept nearly all passerines hunkered down, so after only a short time I headed back north. There were several highlights to this, otherwise unbirdy day, but the trip back along the coast wasn't one. It began to snow, followed by a brief sleet interlude. Getting pelted in the face with ice isn't my idea of fun, so thankfully it didn't last very long. Sixth Avenue is interrupted at 37th Street by Green-Wood Cemetery, so I have to ride down to 5th Avenue, around the cemetery, then back up at 24th Street. The good news is the detour takes me passed the Aladdin Bakery. The aroma along that stretch is so amazing that all I want to do is ride faster so I can get home and make some toast. As I passed the main entrance to the cemetery I noticed something unusual on the tallest spire. Big Mama was perched on the point, scanning the hillside. The normally bustling Monk Parakeet nests just below the Red-tailed Hawk's feet were uncharacteristically quiet.